Ryan Patrick Rock Island Red 2005, an outstanding red blend from Washington state. Rated 90 points in Wine Spectator, it's just $14.98 a bottle on sale at Wine Library ... Log on to place your order today! We won't dip quite as far down the food chain today as Monday's $8 Chianti, but this Grenache-based red from the Languedoc represents another fine bargain. 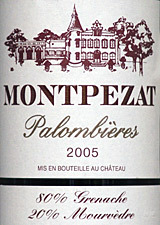  Montpezat 2005 Coteaux du Languedoc Palombières ($11.99) Red fruit and crisp, food-friendly acidity wrap up a simple but attractive package that carries its 14% alcohol well. The Languedoc, as we've discussed before, could be described as the "other half" of Provence - it extends along France's Mediterranean coast from the mouth of the Rhone River west to Spain - mirroring Provence's stretch eastward from the Rhone to the boundary with Italy. Languedoc incorporates the cities of Montpellier and Toulouse and the lovely medieval village Carcassonne, among others, taking in seacoast, fields and mountains. You'll find just about all the same familiar wine grapes in Languedoc as you do in Provence and the Southern Rhone: Grenache, Syrah, Mourvèdre, Carignan and a few others in the reds; Marsanne, Roussanne and Viognier and more in the whites. As a curious aside, the region takes its odd name from "Langue d'Oc," which means something along the lines of "The language of 'Oc'," the word for "yes" in Occitan, the ancient language of the region, a fact that bemused the more northerly French who said "Oui." Within most of our lifetimes, Languedoc was lightly regarded by wine enthusiasts because, much like California's agricultural Central Valley, it was primarily a source of high-production, hot-weather grapes used to make inexpensive table wines that were modest in quality at best. But like much of the rest of the wine world, individual Languedoc producers have moved upscale in recent years. While the region still may lack the cachet of Burgundy or Bordeaux, many Languedoc wines - particularly artisanal and estate-bottled production - command respect around the world of wine. I'm ready to say "Oc!" about today's featured wine, a blend of 80 percent Grenache and 20 percent Mourvèdre from the Coteaux du Languedoc, the hillsides north of Montpellier, a nicely balanced and hearty red and a very good bargain at just a buck or two north of $10. See below for my tasting report. One highly rated wine you may have missed: Ryan Patrick Rock Island Red 2005, an outstanding red blend from Washington state. Rated 90 points in Wine Spectator, it's just $14.98 a bottle on sale at Wine Library, and drinks like wines selling for 2-3 times that price ... Log on to place your order today! Click here for details! FOOD MATCH: I'm rarely loath to make a cross-Latin match between a French wine and an Italian meal, and scored this time with a lighter-style summer version of Italian-American spaghetti and meatballs with Pecorino Romano cheese: The meatballs were local natural beef and the topping was no thick, long-simmered, caramelized "gravy" but a quick, fresh garden-tomato sauce. VALUE: An easy choice at just over $10 in these economic times. WHEN TO DRINK: No worries about holding it for a year or two, but I wouldn't try to cellar it.